Height 5 feet 4 inches. Weight 140 lbs. Chest 32-35 inches. Complexion fair. Eyes grey. Hair brown. Eyes both 6/6. Hearing, colour vision and teeth all good. Limbs and chest well formed. Full movement of joints. Heart and lungs normal. Son of James and Bridget Mary KEEFFE, of Burkes Pass and who had both died before the outbreak of war. His brother Alexander Bruce Smith KEEFFE also served in WWI. 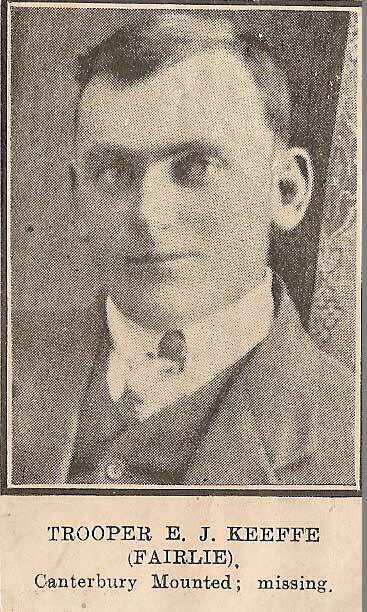 Brother George James KEEFFE was next-of-kin for both Alec and Edgar. Brothers George James and Alfred John were both in the WWI Reserves.. Edgar was first reported as Missing, then as result of Court of Enquiry he was reported on 19 January 1916 as Killed in Action. Edgar was one of two men originating from the Fairlie district to suffer the same fate in the same battle on the same dates, the other being Ringin Ballantyne. His medals, plaque and scroll were all sent to his brother George at Kimbell. Edgar was well known and much respected in the Mackenzie Country. Cenotaph Database [13 April 2014]; NZ Defence Force Personnel Records (Archives NZ ref. AABK 18805 W5541 0062918) [04 May 2014]; CWGC [14 April]; NZ BDM Indexes (DIA) [14 April 2014]; Timaru Herald, 21 September 1915 [x 2], 21 January 1916, Ashburton Guardian, 21 September 1915, Oamaru Mail, 21 January 1916, Otago Daily Times, 21 January 1916 (Papers Past) [05 May 2014; 06 May 2014]; SCRoll web submission from M Konings, 30 January 2015; McLeod, J D (Sergeant), fl 1915-1917. McLeod, John Duncan, 1887-1938 : First World War diary. Ref: MS-Papers-1382. Alexander Turnbull Library, Wellington, New Zealand.